CPM means “cost per mille” or, more modernly, “cost per thousand”. Mille is the term used for a thousand impressions in the ad business. It’s an everyday metric that advertisers and ad networks use and it has its origins all the way back at the beginning of online advertising. 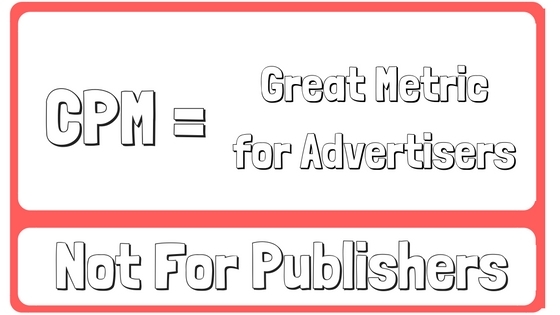 So what is CPM good for if you’re a publisher or website owner, and why do advertisers love to focus all of their measurements on it? As for online publishers and site owners, you’ll undoubtedly see CPM used by most ad networks and touted as the de facto metric that you should be focused on if you want to earn more money. However, it was created by ad networks and is often manipulated by them to serve their end goal — to generate more revenue for themselves — which doesn’t necessarily mean more revenue for the online publishers and website owners. Your website receives a fixed number of visitors. As such, your goal should be to maximize the amount of revenue that you earn per visitor (or session). CPM DOES NOT MEASURE THAT IN ANY WAY. What is CPM? It is the revenue generated from every 1,000 ad impressions that were rendered in the browser. This is not the same thing as revenue earned from visitors. 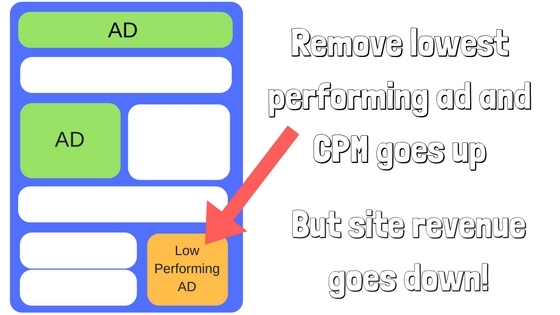 For example, if you go to your website and remove your worst ad position, your CPM will increase – however, your overall revenue will go down. Counting fewer impressions means that your CPM rate looks higher. $10 in revenue on 2,000 impressions is a $5 CPM, but $10 on 1,000 impressions is a much-more-attractive $10 CPM! This even happens with Fixed CPM Ad Networks. Ad networks achieve this by only displaying ads to highest value users and “passing back” the rest. The end result is that the ad network appears to be the highest performing network when, in fact, they are simply taking all of the highest value impressions away from other competition that may have generated more revenue. This is very common current with Facebook Ads, Criteo and traditional ad networks that have a “pass-back” feature. Action Item: If a network has pass-back functionality – run for the hills! Unfortunately, a very common tactic for ad networks is either intentionally under-counting or under-reporting impressions. Again, the goal of an ad network here is to reduce the number of impressions that the revenue is divided by, therefore increasing your CPM rate, with the hope that you’ll send more traffic their way. Action Item: If an ad provider doesn’t display per-user revenue – go somewhere else – their interests aren’t aligned with yours. Ads that provide a poor user experience or deliver a very high click-through rate with a low CPC are costing you money. An ad provider that is measuring it’s performance via CPM has one goal — to generate the most money from showing a single ad in a fixed location. They have no interest in that user’s experience on your website, how many pages they view, or if they return to your site. Their admitted goal is to get them to click on an ad and leave your site. Opportunity Cost / Cannibalization is very common in the industry today and is something that nearly every ad provider is guilty of — but it is most prevalent with native advertising. Native advertising tends to pay publishers a very low amount per click but displays ads that a high percentage of people click on. The end result is that publishers lose a significant portion of their traffic to the advertisers and lose out of future opportunities to generate revenue from those users. 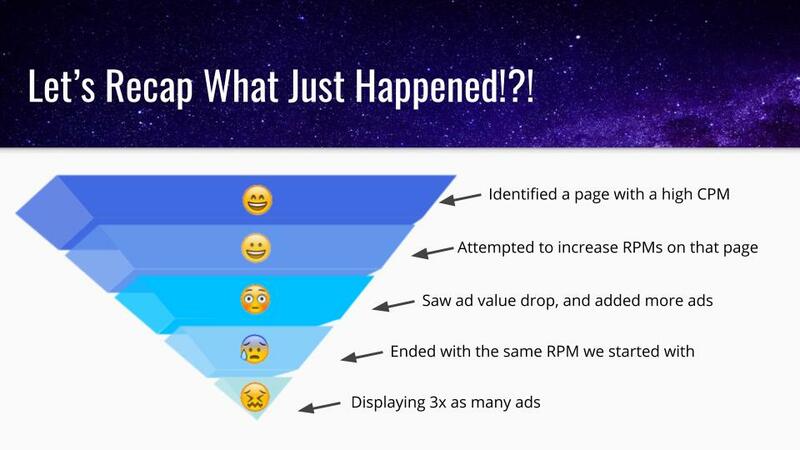 Check this example out of why ads dilute other ads and how optimizing CPMs actually reduces RPMS and total revenue over time. A visitor lands on a website that averages 10 pageviews per session. This individual is in the market to purchase a new TV and advertisers are paying a $5 CPM to show ads to the user. In a typical session, the user would view 10 pages, 4 ads per page for 40 ads in the total. This will make the publisher 20 cents even if the user doesn’t click on an ad. Instead, the publisher displays a native ad saying “Top 10 Amazing Bikini Mistakes” – the users clicks – and the publisher earns 2 cents – a net revenue loss of 90%. The native ad provider is proud to display a high CPM rate for that ad unit because they are only concerned with the one ad and they are comparing against the potential revenue of 40 ads. 2 cents from 1 ad is a $20 CPM. 20 cents from 40 ads is a measly $5 CPM. Which do you want, 2 cents at a $20 CPM or 20 cents at a $5 CPM? Ad networks “show fewer ads” in a number of ways, but common ways are through geographic, device or ad location restrictions. Many networks will only fill inventory, for example, to users in the United States. Others might only want ads above the fold. The effect these restrictions have is creating an uneven playing field and, therefore, making it impossible to compare performance using CPM. Is an ad network that only shows ads above the fold and earns a $1.00 CPM better than one that shows all ads and pays an $0.80 CPM? Is an ad network that earns $2.00 CPM in the US only better than one that shows to all geographies and earns a $1.70 CPM? The reality is that it’s nearly impossible to determine unless you start measuring per-user-value. Action Item: Avoid all companies that place restrictions on who or where you can show ads unless you’re tracking per-user revenue. As you can see, CPM is an industry darling. It was created to try and measure the value of showing a single ad in a single location and is still useful for advertisers and ad networks — but it’s nearly useless for publishers and should be avoided at all costs. If you’re not already tracking and recording your website’s performance on a revenue per user or revenue per thousand user basis, today is the day to start (learn how by clicking the link)! It will be the single most productive change you make to your business all year. 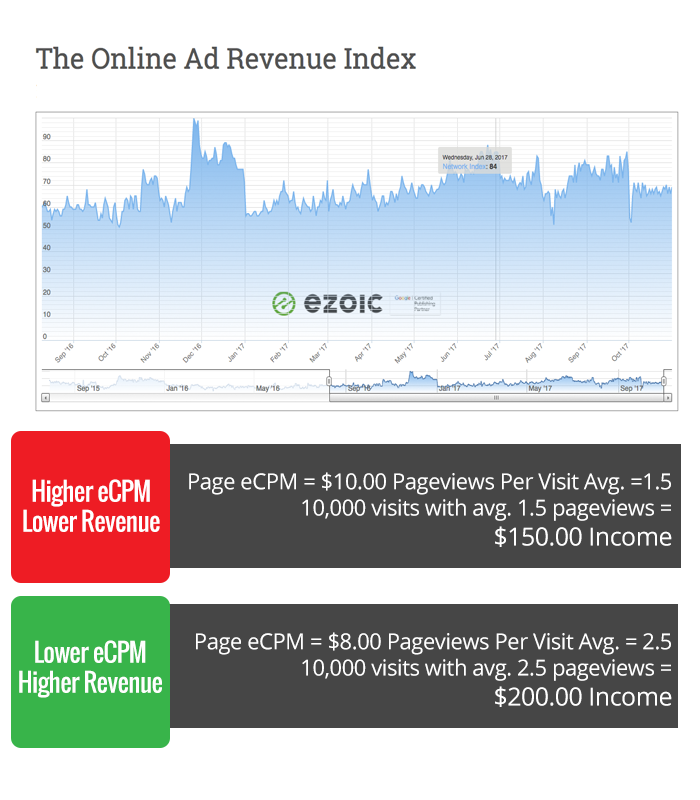 If you want to see the current market and seasonal trends in EPMV, check out the Ad Revenue Index. It’s a free index where publishers can see how much the collective market is earning at any given time.